Louise DuArt and Squire Rushnell are executive producers of the Hallmark show. 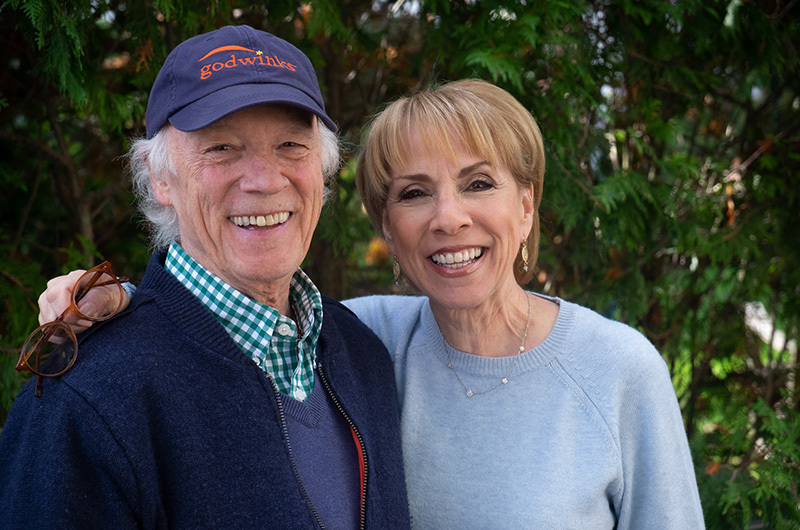 A well known Edgartown couple and an iconic Edgartown landmark will be in the spotlight this holiday season when a new movie premiers on Hallmark television, and is later screened as part of Christmas in Edgartown. 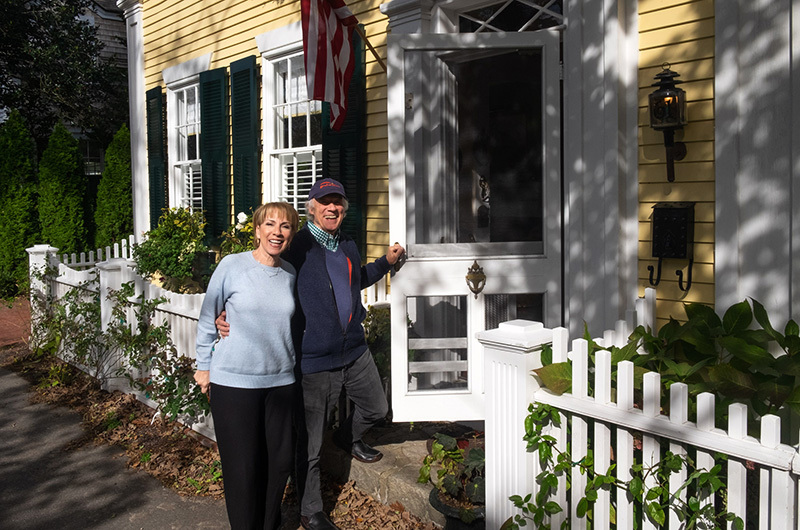 The movie, A Godwink Christmas, is the story of how Charlotte Inn owners Gery and Paula Conover met more than 30 years ago, with the inn also playing a starring role. The movie is scheduled to premier on Nov. 18 at 9 p.m. on the Hallmark Movies and Mysteries channel (channel 141 on Island Comcast cable television systems). On Dec. 6, the film will be screened at the Edgartown Cinema, to kick off Christmas in Edgartown. Sponsor Martha’s Vineyard Savings Bank will host a private screening for invited guests at 6 p.m. Then shortly after 7 p.m., the public is invited to see the second screening. The movie stars Kimberly Sustad, Paul Campbell and Kathie Lee Gifford. Executive producers of the film are Edgartown residents SQuire Rushnell and his wife Louise DuArt. Mr. Rushnell was a vice-president at ABC television, and Ms. DuArt is an accomplished actor and comedienne. Together, they have authored a series of books with Godwink stories. In the true romance story of the Conovers, Island weather plays the role of the Godwink that brought them together. It seems that all those years ago, Paula Conover flew from her home in St. Louis to Nantucket to consult with a favorite aunt. She was having doubts about accepting a marriage proposal from a suitor in St. Louis. She and her aunt decided to fly to Martha’s Vineyard for the day, but at the last minute her aunt (played by Kathie Lee Gifford in the movie) couldn’t go. Paula Conover came to the Vineyard on her own to sort things out. That’s when foggy weather began to steer events. Two fog delayed airplanes, one shortage of taxis, and one fortuitous friend’s introduction later, Mr. Conover was squiring his future bride around the Island, discovering the connections that would lead them to marriage. “It’s just a wonderful love story,” Mr. Rushnell said. ending. The Godwinks come at the beginning of the story. Four years ago, Mr. Rushnell and his wife pitched six Godwink stories to Hallmark television executives. The one they were most interested in, was the story of the Conovers. Hallmark shoots almost all of its movies in Vancouver, British Columbia, Canada, and this one was no exception. The production lasted four weeks, and it was shot in the middle of the summer, which poses some interesting problems for a Christmas movie set in New England. The mountains which form a backdrop for the Canadian city were also a potential problem. The reason? Forest fires in California and British Columbia caused smoke to drift over the city, blocking out the mountains. “There was a gray sky in the backdrop of all the exterior scenes,” Mr. Rushnell said. Another production problem was finding a suitable establishment to represent the Charlotte Inn. Mr. Rushnell and Ms. DuArt rejected several inns that the production crew scouted, but finally settled on a chateau near the city. In order to give the movie more of a Vineyard flavor, a film unit traveled to the Island last December, to capture exterior scenes that could be edited into the film. In what they see as yet another Godwink, the weather cooperated with the film unit. “Miss speed dial to above,” Mr. Rushnell said gesturing toward his wife, “prayed for snow, and we got snow.” The snow stayed until just after the film crew wrapped up its work, melting when the temperatures warmed up just hours after they left the Island. The couple is looking forward to seeing the reaction of Island residents to the Vineyard scenes included in the movie. “The opening of the film is the Edgartown lighthouse, that’s the first thing you see,” Ms. DuArt said. “Whenever we do scene changes you see a little of this, a little of that, shots from around town,” Mr. Rushnell said. The final scene in the credits of the movie is the most realistic of all. It’s a portrait of the real Conovers in front of the real Charlotte Inn. Loved the movie. Heading to MV for Thanksgiving and can’t wait to visit the Charlotte Inn. What a wonderful project. Can't wait to see it. What make and model and year is the black car that Gerry drives? I loved the settings in this movie! What a beautiful movie. Christmas time is truly magical bringing happiness to couples in such unexpected ways. Looking forward in spending time at B&B’s in the near future. Hallmark does it well as they capture all the right places and special moments that have meaning in which people can relate to. I am carrying on the tradition of watching hallmark Christmas movies without my mom this time. She passed away Oct 3rd. It's a little melancholy. But I love the feel good vibe I always get from hallmark movies. Godwink is no exception! I was glued to my seat watching it. I taped it and just now watched it. Very romantic and very charming too. Awesome movie loved it! Curious as to the car that is being driven is that a Monte Carlo? No, that is a 1965 Buick Riviera.